Orthodox Jewish Chamber of Commerce gives official endorsement to Likud candidate Ze’ev Elkin for Jerusalem mayor. As the race for Jerusalem mayor heats up – the election will be held on October 30th – the Orthodox Jewish Chamber of Commerce (OJC) has given its official endorsement to Likud candidate Ze’ev Elkin, who serves as Minister of Jerusalem Affairs and Heritage and Minister of Environmental Protection. The endorsement was finalized after extensive discussions amongst the Wall Street-based organization’s leadership, and committee members in both the United States and Israel. Duvi Honig, Founder and CEO of the OJC, says that ultimately the decision was clear. 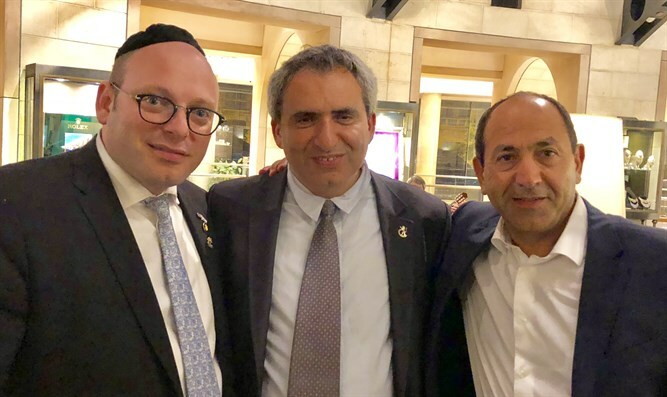 Minister Elkin was initially introduced to the OJC at the King David Hotel during the VIP dinner capping its first U.S.-Israel Business Alliance mission to Israel, which was headlined by Governor Mike Huckabee. Since then, OJC leaders and activists have held meetings and discussions focused on economic development issues, and particularly the struggles faced by the capital’s many Anglo-Israeli residents, hailing from the US, Canada, England, Australia and other English-speaking countries. The municipal government lacks even the basic infrastructure necessary to cater to these residents, even as they struggle to find quality jobs and start businesses, hampered by language and cultural barriers. Even highly motivated and talented Anglo-Israelis must often settle for subpar wages and opportunity, while struggling to cover the fast-rising cost of living. “Minister Elkin has demonstrated a keen understanding of these issues and has clearly committed to us that, as mayor, he will work together with us and others to build the infrastructure and bridges necessary for all Jerusalem residents to move ahead,” says Honig. Minister Elkin was born in Ukraine and immigrated to Israel in 1990. As such, he has a unique understanding of the obstacles that immigrants face trying to climb the ladder in Israel. In many ways, Anglo-Israelis face even greater obstacles than Soviet immigrants did when Minister Elkin arrived. The OJC and its Israel Committee have worked together with myriad elected officials, diplomats and governmental and community organizations to boost economic opportunity and build bridges between the business worlds of the US and Israel. In addition to the annual U.S.-Israel Business Alliance missions, the OJC hosted a highly successful “Anglo-Israeli Empowerment Conference” business conference, expo and networking event at the Jerusalem Gardens Hotel; and an Israeli “FinTech” expo to corporate leaders in Manhattan. Honig notes that when Prime Minister Binyamin Netanyahu underwent surgery last May, he designated Minister Elkin as Acting Prime Minister until he was able to return to duty. “Ze’ev Elkin was trusted to run the country; we are confident that he will make a superb mayor and are honored to do everything we can to help him get there,” says Honig.